Colegio Delibes is fully equipped with twenty six air conditioned classrooms students, lectures and video room, library, internet area, free wifi and a Castilian patio. Our college's best characteristic is a very international ambience with a wide range of guided after-class activities (most of them are free) included in our complete program, our main concerns is a personalized service with the best price. 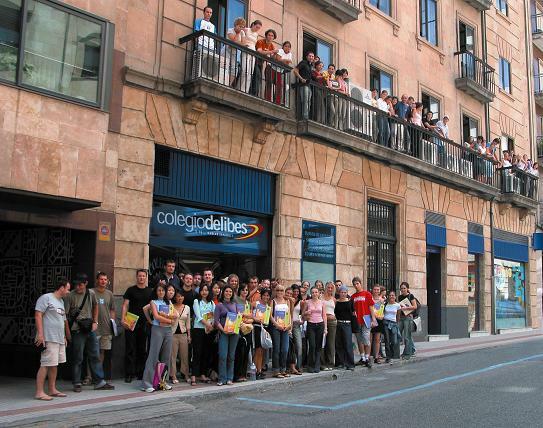 Colegio Delibes offers small groups (10 students max per classroom) ten different levels of learning, 14 types of courses, 5 types of accommodation as well: Host families, shared apartment, student residence, studio or hotel and a program full of activities, like parties, excursions, visit tours, sports, cooking lessons, tapas tours. Intensive interactive courses with 4 to 6 hours lessons per day. Wide range of courses at all levels (10 different ones). 40 different nationalities of all ages. Maximum of 10 students in the classroom. Choice of high quality accommodation (including host families, student residence, apartments, hotels). Extensive range of extra academic, cultural activities and sports.